Maybe The Players Really Is A Major! Who knew laptops were so fragile? 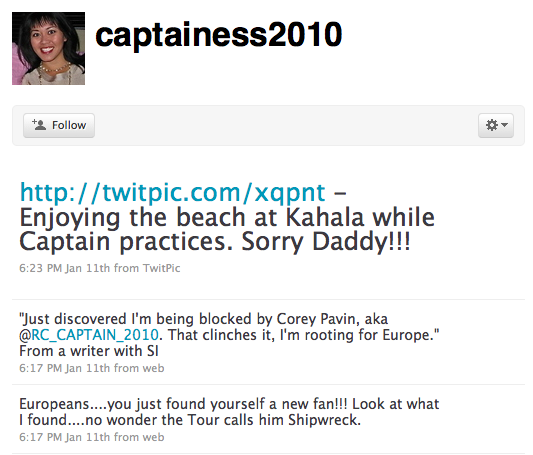 Or is it Mrs. Pavin putting the kibosh on Shipnuck? And Stephanie Wei highlights an adorable Natalie Gulbis mistake. Make that, two mistakes. "Go thing I have already looked my card up for next year! Your Welcome." 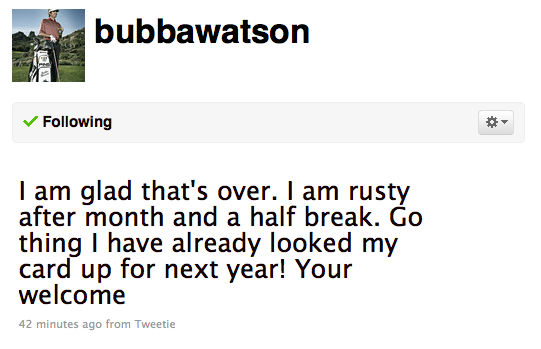 "Your Welcome" would be the gramatically challenged catch-phrase Bubba Watson is sporting under his Twitter persona. "Christian, Husband, Pro Golfer who enjoys giving back to help others grow in life! You're welcome. Thanks to reader Jim for the heads up on his latest Tweet, which will not do much to negate stereotypical characterizations of men named Bubba. Tiger Will Not Be Fined, But I Bet These Boys Will Be! Q. Have you heard from the TOUR regarding Sunday and the fine, and also, you're not a guy that typically putts his cards out on the table, and Padraig was in here earlier saying that it was easier for you having won the tournament to say what you said, and he felt in his position he would keep his mouth shut; why do you feel you had to say what you said if you felt that you needed to, and is there a point to be made with that, put your whistles away at the end of a game and let the players decide it? TIGER WOODS: Okay, what part of your question do you want me to answer first? (Laughter). Q. First have you heard from the TOUR? TIGER WOODS: Yes, I've heard from the TOUR and there's no fine that. Was an erroneous report. Now I know they haven't hired the VP of PGA Tour Tweet Monitoring yet, but I'm getting a vibe that stuff like this will force their hand. Ian Poulter Tweeted a photo the other day and then apologized after apparently getting a lot of complaints, which is why the image and a couple of other Tweets sounding a wee bit iffy subsequently came down! The flood of fascinating, deep and almost-malaprops from pro golf's finest Tweeters has forced my hand: introducting, the Tweet O' The Week.